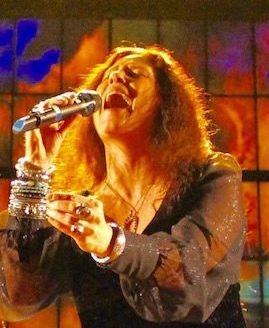 In the event it matters to you, (and it shouldn't) there are two singers appearing as the legendary "queen of rock n' roll" at alternate performances of A Night with Janis Joplin at the McCarter Theatre Center's Matthew Theatre. Although it might have been interesting to see and compare them both, I can only report that the performance that Kelly McIntyre gave at the Saturday matinee on September 14th was pretty sensational. It is safe to assume that her alternate Kacee Clanton who played Janis on opening night and who was an alternate in the 2013 Broadway production is also great. Having an alternate is certainly understandable considering the demanding, hell-fired vocals that define Joplin's style. Part of the excitement for me was seeing how McIntyre and her company were able to whip up a matinee crowd that filled only about half of the theatre. The flashing, crisscrossing beams of light (by lighting designer Mike Baldassari) that streak around the theater at the beginning are meant to dazzle. It's all in anticipation of Janis Joplin, whose life was tragically ended at the age of twenty-seven by an overdose of drugs. It doesn't take long for this Joplin to transcend the obligatory razzle-dazzle. It was gratifying to hear the increase of applause, shouts and whistles that greeted the singer and the entire company throughout this searing biographical concert, earnestly written and smartly directed by Randy Johnson. Extraordinary support comes from super singers Sharon Catherine Brown, Tawny Dolley, Sylvia MacCalla, Amma Osei. Billed as The Joplinaires they not only do back up but also get their own individual spotlight to evoke such late great ladies of jazz as Bessie Smith, Nina Simone, Odetta, Aretha Franklin and Etta James, The Chantels and a Blues Singer. A sensational band of eight did more than serve as back-up as their splendid playing enveloped the theatre. My more knowledgeable companion noted that this band was far better than the one that Janis had. I wish the sound designer would finesse the amplification so that lyrics to songs could be heard better than they are. Except for the cast, the show has not changed since my 2013 I reviewed CurtainUp which includes a song list. You can check it out here . .
Matthews Theatre at the McCarter Theatre Center, Princeton, N.J. Performances: Thursdays at 7:30 p.m. Fridays and Saturdays at 8p.m., Saturdays and Sundays at 2p.m.